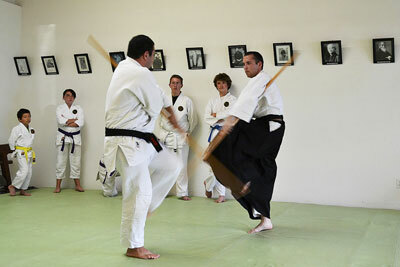 Bojutsu is the art of combat centering on the use of the stick (staff) in various lengths and diameters. Depending on the size, it may be used with a two or one handed grip. Although many martial arts use a form of stick fighting, the ones more influential to Aibukan Budo practice are from China, Okinawa, mainland Japan, and the Phillipine Islands. Techniques related to the use of the stick usually include; striking, counter striking, blocking/parrying/deflecting, thrusting (stabbing), cutting (slashing), sweeping, holding (control locks), and retention (grabs & releases). Techniques are also related to the action use of other weapons such as; the spear, lance/halberd (Naginata), the sword, knife and other edged or striking weapons. 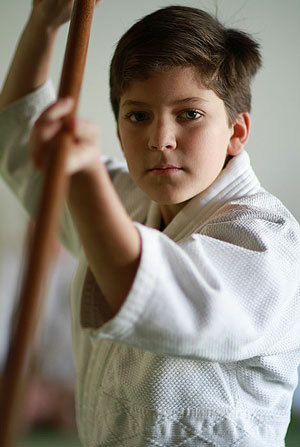 The Aibukan Dojo curriculum includes several sizes of stick practice. The size of the stick gives the practitioner the possibility of changing the fighting distance between long and short range. The Aibukan Dojo uses the following sizes of stick; 6 foot (Bo), half of 6 feet or 3 foot (Hanbo, Cane like), Japanese white oak 50¼ inch by ¾ inch diameter (Jo), less than 36 inch to 12 inch (Tanbo, short stick/baton), less than 12 inches (Yawara stick). The Aibukan dojo stick techniques are influenced by systems of Bojutsu, Jodo, Tanbo, Keibo (Police Baton), Yawara stick pressure control, and Eskrido. Jodo (the way of the stick) was founded by Muso Gonnosuke Katsukichi around 1605. The system primarily uses a Japanese white oak stick 50¼ inches in length and approximately ¾ to 1 inch diameter. Muso was said to have had a match with Japan’s most famous swordsman Miyamoto Musashi and lost. Muso sequestered himself after the loss to Musashi, in order to rethink the essence of technique that is today known as Jodo. Muso retreated to Japan’s most southern island of Kyushu Fukuoka prefecture, for 37 days at the Kamado Shrine on Mount Homan. Muso obtained thought for his technique from his previous experience in use of older weapons. Jodo incorporated the thrusting movement of the spear (Yari), sweeping movement of the halberd (Naginata), striking movement of the staff (Bo), and cutting movements of the sword (Daito/Katana). With these new techniques the art of Jojutsu was born. Jojutsu is considered a Koryu or old style of Budo (Martial Arts) that is some 400 plus years old. The headquarters had remained in Fukuoka until the death of the 24th Headmaster in 1927 (Shiraishi Hanjiro Shigeaki). At this time the Headmaster’s high ranking students/instructors Takayama Kiroku, Shimizu Takaji, and Otofuji Ichizo continued to teach Jojutsu. In 1927 Shimizu Takaji went to the Tokyo area to teach the Metropolitan Police Department and the Kobudo Reasearch Group at the Kodokan Judo Headquarters. Some time after the death of his teacher, Shimizu became head of the Dai Nihon Jodo Kai (Greater Japan Jodo Association). In 1940 the Name of Jojutsu was officially changed to that of Jodo. Shimizu Sensei also had his own Rembukan Dojo and became known as the 25th Headmaster of Shindo Muso Ryu Jodo. In 1955 the All Japan Jodo Federation was established and in 1960 Jodo was recognized by the All Japan Kendo Federation. Shimizu and Otofuji Sensei were asked to devise a condensed syllabus of Shindo Muso Ryu Jodo study that would give the essence of these techniques. In 1968 the Kendo Federation adopted 12 Setei Kata from the first 3 levels of the Shindo Muso Ryu system. Shimizu Sensei passed away in 1978 without naming a successor however, he had trained many notable Japanese and foreign students to the level of Master License (Menkyo Kaiden). A few who have influenced the training research at the Aibukan Dojo are; Nishioka Tsuneo, Philip Relnick, Don Draeger, and Pasqual Krieger. The name of Shindo Muso Ryu Jodo in a 1996 writing by Nishioka Sensei is sometime referred to as Shinto Muso Ryu Jodo. The primary techniques are stick against sword however it is important to note that the complete Shinto Muso Ryu Jodo system actually includes six arts. They are; Tanjo (short stick), Daito/Shoto (long and short sword), Kusarigama (chain and sickle), Jutte (metal truncheon), Hojojutsu (tying arts), and Jo (stick). The Jodo as practiced at the Aibukan Dojo has the technique base origin of structure from the All Japan Jodo Federation and Kendo Federation. The condensed version of Seitei Kata from this structure fits well with the extensive curriculum of Aibukan Budo. The Aibukan Dojo practice of Jodo includes; 12 Kihon (basics), 12 Seitei Kata, and 3 Aiki Jo Kata. Kenjutsu is the art of Japanese Swordsmanship combat. The most famous of all Japan’s sword masters, was Miyamoto Musashi (1584-1645). Kenjutsu is the older version from which the modern aspects of Iaido and Kendo came to be. Kenjutsu uses primarily the live cutting blade (Shinken). Whereas, other forms of Iaido and Kendo use non cutting metal blades (Iaito), wooden swords (Bokken), or bamboo swords (Shinai). Kendo is most known for being sport like Japanese swordsmanship. Japanese Swords are divided mostly into two type; long sword (Daito or sometimes called Katana), and short sword (Shoto or Wakazashi). There are four primary basic actions to sword use; Nuki-tsuke (drawing the sword from the scabbard/saya), Kiri-tsuke (cutting action), Chiburi (blade clearing/cleaning), and Noto (re-sheathing into the saya). The curriculum of Aibukan No Ken (Aibukan Sword) is divided into two approaches to practice. The approaches are classical old Kenjutsu, and that of Aiki Ken (Aikido Sword thought). 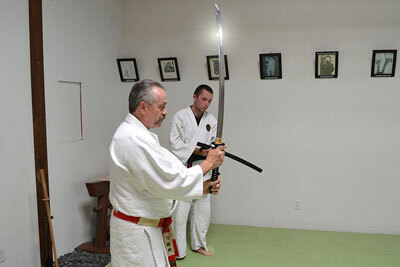 The classical approach is a study toward combat applications with the sword used by ancient Japanese Samurai. The Aiki Ken (Aiki sword thought) has a projection that the use of the sword gives way to the increased understanding and ability of Aikido technique. The Aibukan No Ken curriculum is made up of the primary systems of Eishin Ryu, and the Japan Kendo Renmei (ZNKR). The curriculum includes five categories of Kihon (basic drill practices; gripping/holding, postures, 8-cuts, 8 directional cuts, 4 actions form with 4 chiburi), 12 Seitei Kata, 5 additional Classical Kata, and 3 Aiki Ken Kata. Aibukan No Ken also includes; Kumi Tachi (pairs practice), Jiyu Waza (free matching/sparring), and Tameshi-Kiri (cutting material of tatami, bamboo etc. ).